Since I talk, live, and breath Paleo, it’s only time that I address the topic of Paleo backlash. 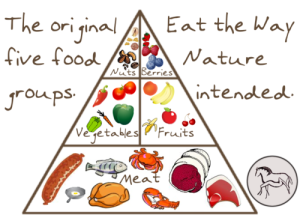 Recently, the mainstream media set its bulls-eye on the Paleo diet. This has been spurred, in part, by paleontologist Christina Warinner’s recent TED talk debunking the so-called paleolithic approach. This sentiment is echoed by one of my coworkers, a renowned PhD who headed a university’s Exercise Science department before joining our organization (for my day job, I work for a science-based athletic and sport performance organization). He is also a competitive endurance athlete who uses himself as a guinea pig for different dietary and nutrition approaches. He’s basically brilliant. I had lunch with him last week, and we talked briefly about the Paleo diet. My coworker said there is nothing wrong with the Paleo diet except for its name. He said while he likes the diet, it’s very misleading, because what we eat today has in no way any connection to what our paleolithic ancestors ate. He pointed to my avocado – which had a small pit and a plethora of rich, creamy flesh – and noted that his morning avocado had a huge pit and very little flesh. Obviously my avocado was probably genetically modified to make it more marketable, consumable, and transportable in today’s world. He was right. Avocados in caveman time were probably rock-hard little nuts with barely any flesh surrounding the pit. And this goes for all the food we eat today – nothing mirrors what, exactly, our ancestors ate. And sorry to bust your bubble, but bacon is not Paleo. Is it delicious and a slap in the face of mainstream dietary recommendations? Yes. Will it kill you if you consume it sparingly? No. But it is a processed food and should be consumed in as whole a form as possible. Meaning thick-cut, non-cured Irish bacon from the butcher counter, not the nitrate-soaked, food dye-injected slabs of sadness sold in the refrigerate section of the meat department. Did our ancestors eat fatty meat? Yes, whenever possible. Granted, fatty meat was rare compared to today’s standards (prey animals are lean to outrun predators), but when fat was available, it was devoured immediately. But they did not eat the foods we eat. And we should be ready to not only admit this, but own this. And even this probably would not appease the masses. No matter what, someone, somewhere, would continue to take issue with our approach of eating high-quality protein and fats, veggies, some fruit, nuts and seeds. I think that no matter what we called the Paleo diet, it would attract backlash. People don’t like when a) they are told their choices are wrong, or worse – making them sick and overweight; and b) food lobbyists and manufacturers will continue to pump misinformation into the media to undermine any dietary approach that doesn’t align with their sales goals. How do I view Paleo? This is how I understand Paleo. I do not trust today’s food system, nor do I trust the recommendations provided by the ADA. I don’t trust anything that is promoted by the very companies that profit from such promotion. From my understanding of biology and bioenergetics (how the body processed nutrients for food), I know that most of today’s modern foods not only have a very detrimental effect on our bodies, but they actually harm us. They are basically nutrient-deficient. The refined foods, the poor-quality fats, the added sugars, the food dyes, the stripped-down nutrients that give our bodies no health benefits but travel well and sell even better. I believe in eating real food and eschewing the processed crap. Most wheat products are processed. There you go. Easy to skip. So what isn’t processed? High-quality proteins. High-quality fats. Vegetables. Fruit. Nuts and seeds. And we have to work hard sometimes to find these foods, because not every grocery store stocks high-quality versions o f these items. This brings us to my conclusion. Ignore the hype. Think of Paleo this way. When people ask what you eat, just say that you choose real food and you skip the processed stuff. When they press further, say you eat lots of vegetables and high-quality protein with ample healthy fats. You like fruit, nuts, and seeds, but you eat those sparingly. When you “cheat” (and we all do, because we are human, not robots), you make sure it’s really worth it. You believe in choosing rich, nutrient-dense food to feed your bod because you prefer to thrive, not just survive. That’s my take on Paleo.